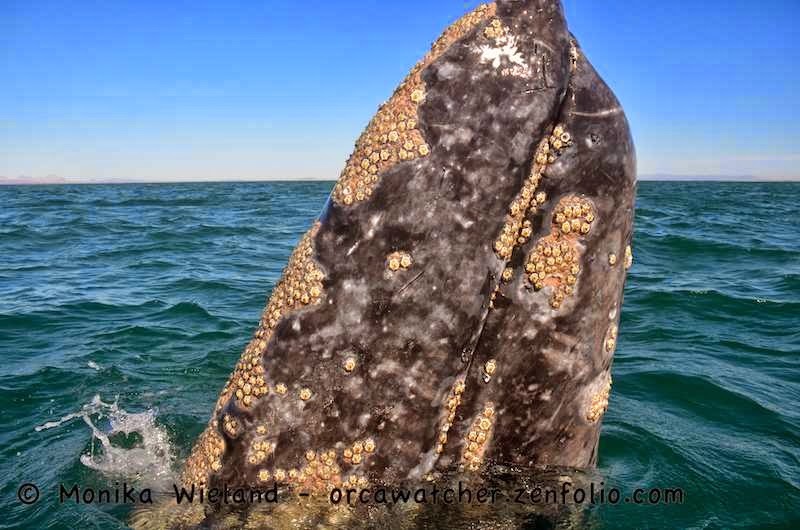 While Laguna San Ignacio is an incredible place to experience in its own right, there's one phenomenon that occurs here that make it a must-visit place for any cetacean lover: Las Ballenas Amistosas, or the Friendly Whales. 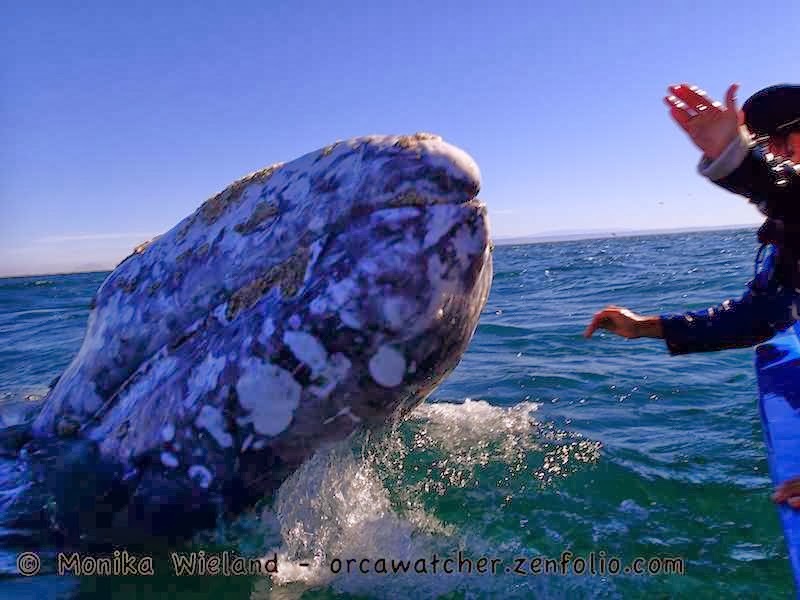 In the 1970s, in the very same lagoons where they were almost hunted to extinction, gray whales started becoming friendly with humans. 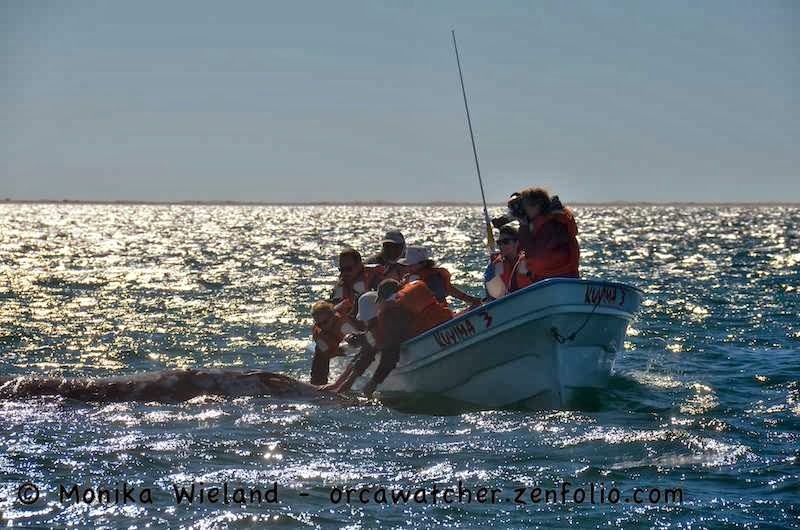 Animals started approaching fishing boats, showing what appeared to be in a mutual curiosity in us, and local fishermen discovered that the whales were willing (and perhaps even enjoyed) being touched. 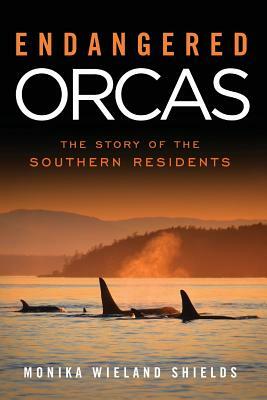 Given what they have experienced as a species at the hand of humans, it's an especially remarkable turn of events. 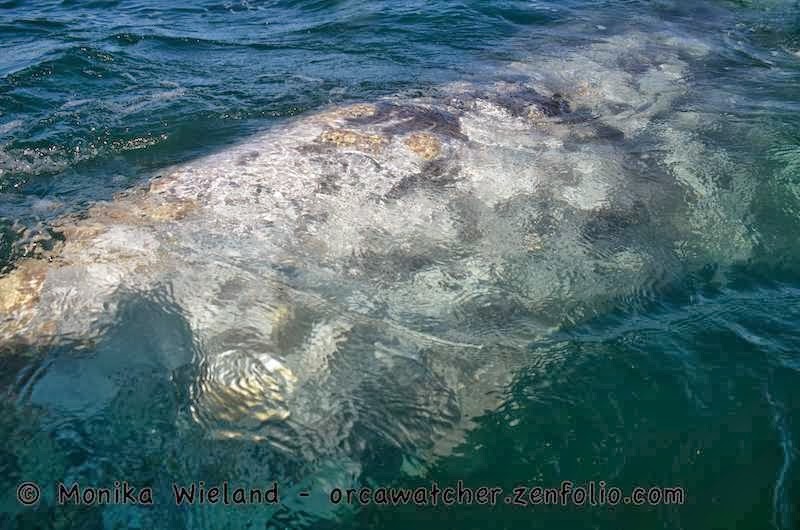 Naturalists say about 10% of the gray whales are "friendly" (does that make the other 90% aloof, I wonder?) 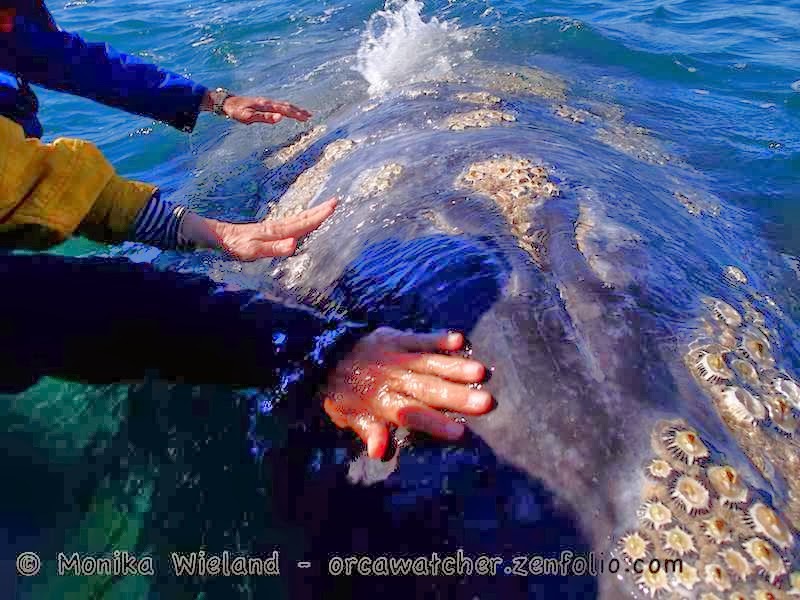 Despite what you see on the travel brochures, an encounter with a friendly whale is not a given (no wildlife encounter ever is). 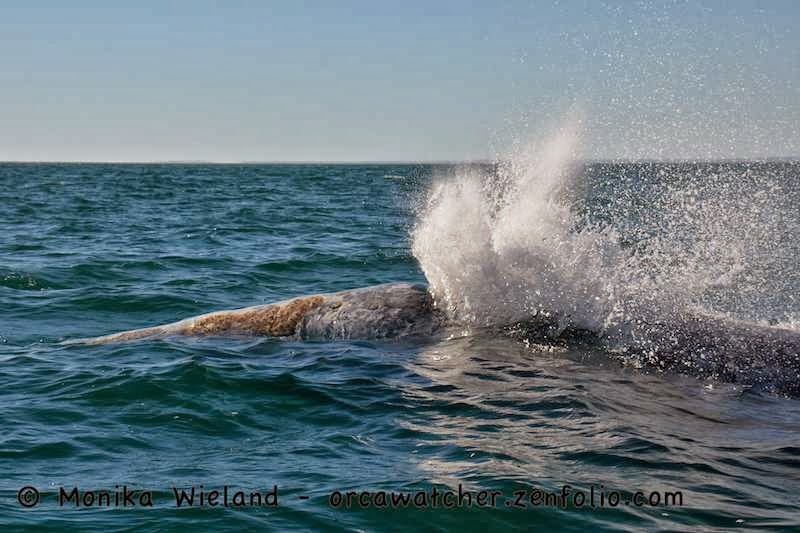 With what we witnessed while we were there, it seemed like fewer whales were friendly than anticipated, most likely because it was early in the season and they were engaged in either pursuing (or attempting to evade) a mate or taking care of a very young calf. 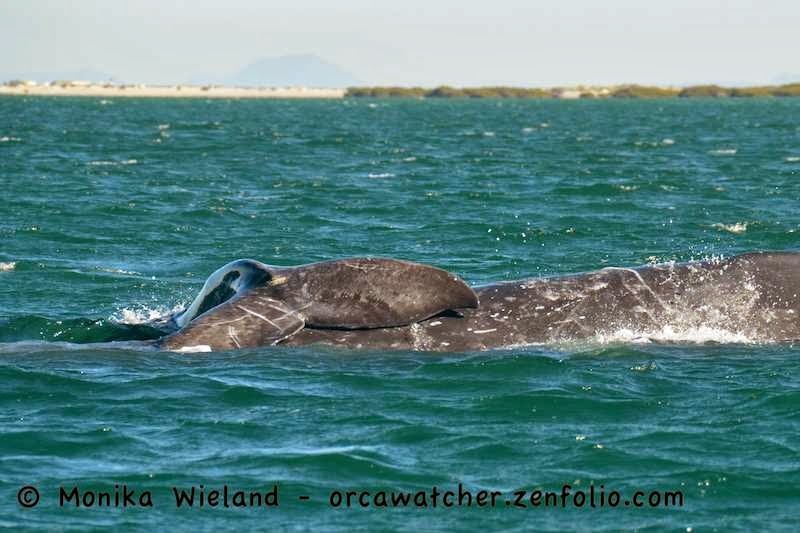 Mothers with calves tend to be more likely to be friendly, with moms often urging their babies over towards the pangas, but this happens more often when the calves are a few weeks older than when we were there. I wonder if really it's the moms looking for a break from taking care of their exuberant growing babies, taking advantage of us willing human babysitters to catch an extra nap before the long migration north! 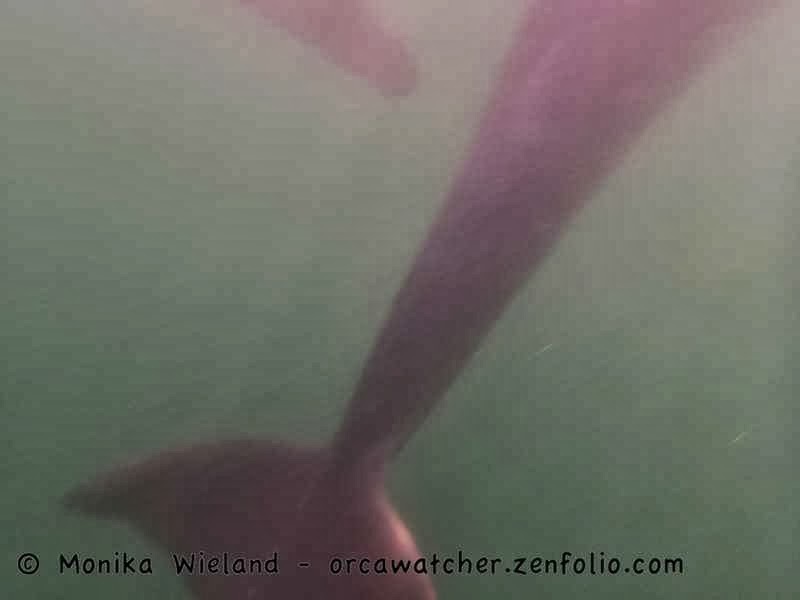 They were close enough to us that for the first time I got out the handheld underwater camera I got specifically for this trip. 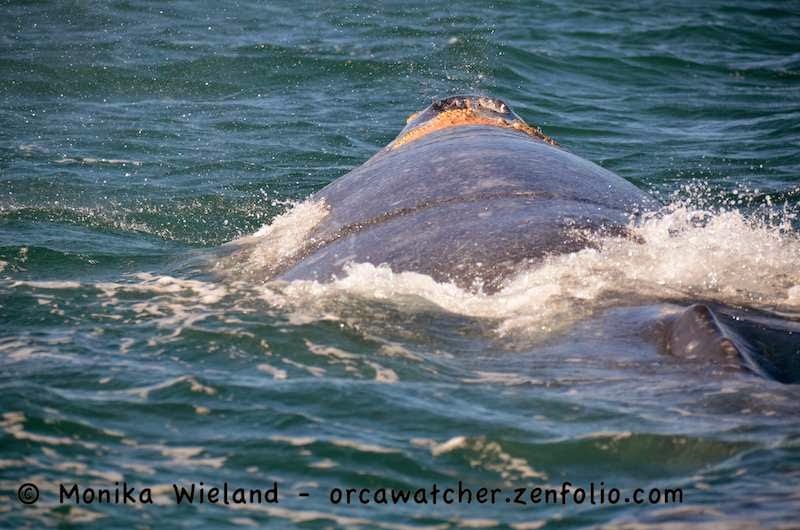 Even though they were only 10 yards or so away, the waters proved too murky for the whales to show up. 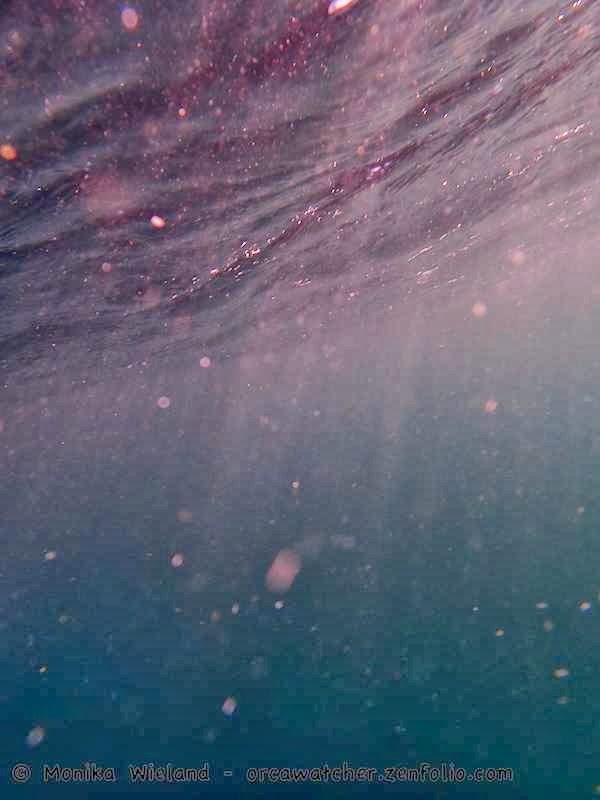 I liked the effects I got in the water shots anyway, though. 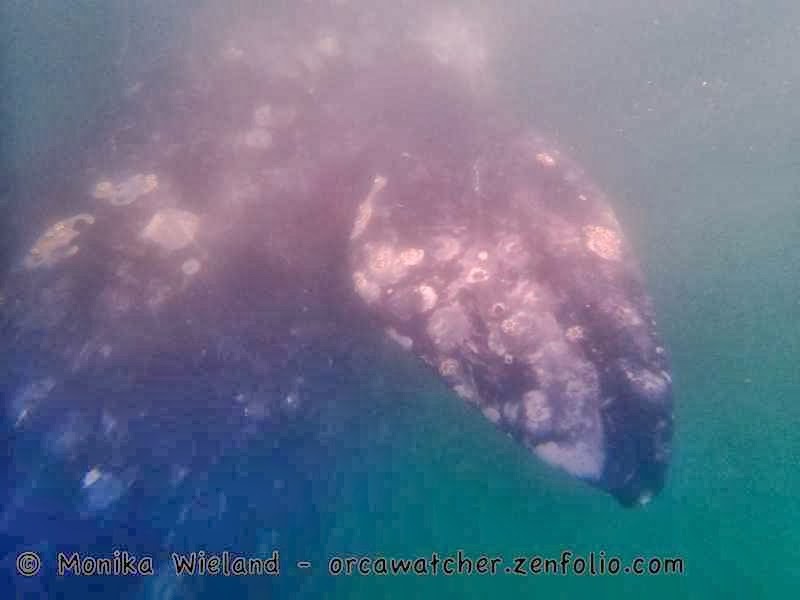 The mama whales all looked very broad - a good sign that they're carrying enough fat reserves to both feed their calves and make it back to their northern feeding grounds. Mom's dispense milk that's 53% fat to their growing babies, all while having nothing to eat. 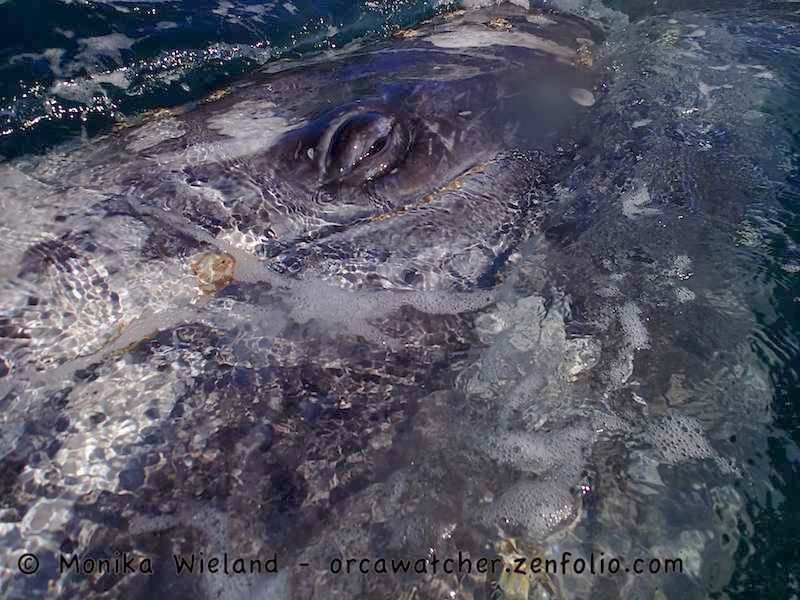 She'll lose about a third of her body weight before reaching the feeding grounds again. 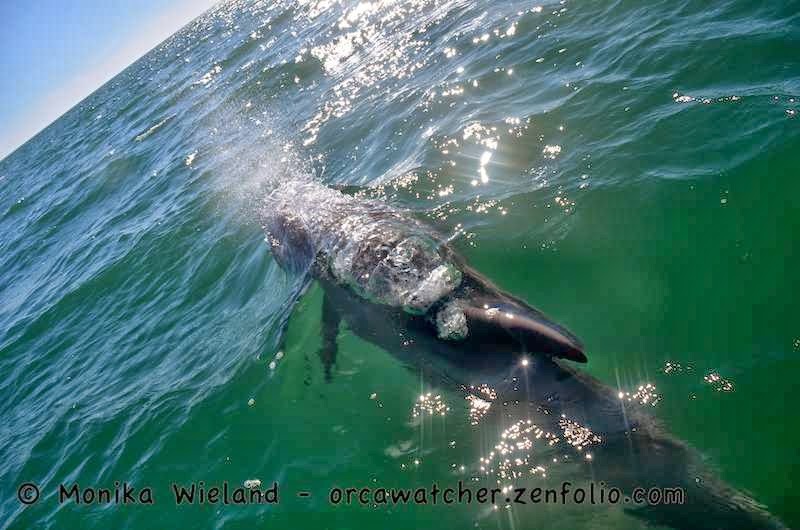 People are so enamored with whales and so desiring of a close encounter that they will try anything to beckon the whales closer. 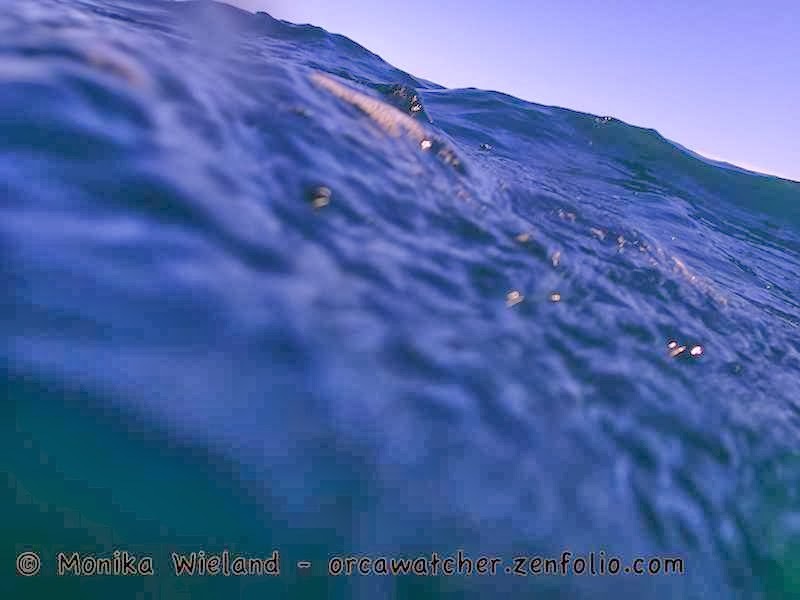 We all at one point or another splashed the surface of the water, trying to attract their attention. There are a whole range of other superstitions, too - a popular one at our whale camp, led by our American naturalist guides, was the shaking of a bag of Jolly Rancher candies. Supposedly "scientifically proven" by an eight year-old, after shaking the bag, the driver gets offered a candy first, then all the passengers. The debate is ongoing as to how effective this method is, but my opinion was solidified by the next whale we met. 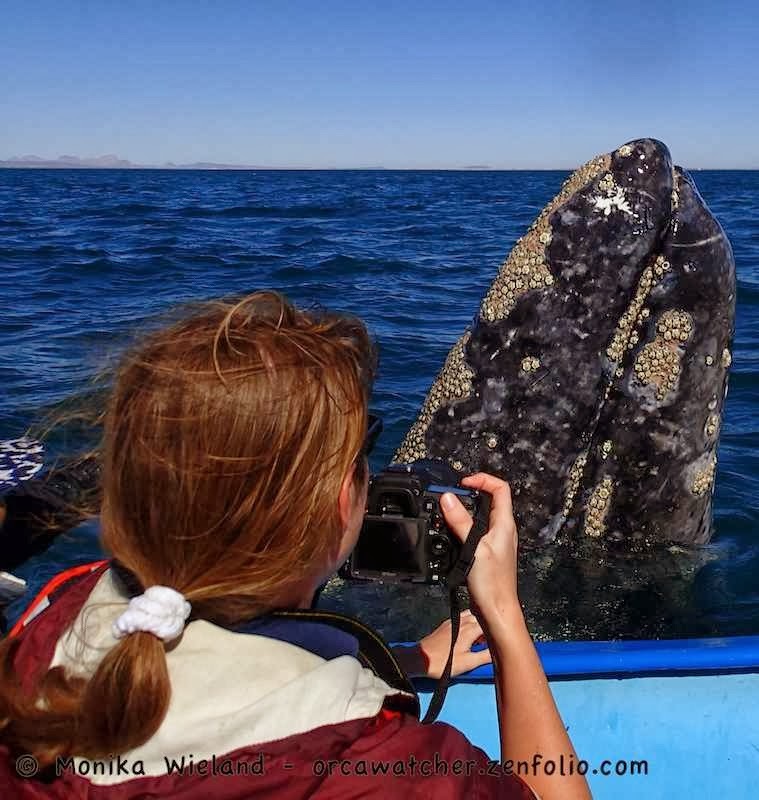 Nothing you do is going to make an uninterested whale come over to you. 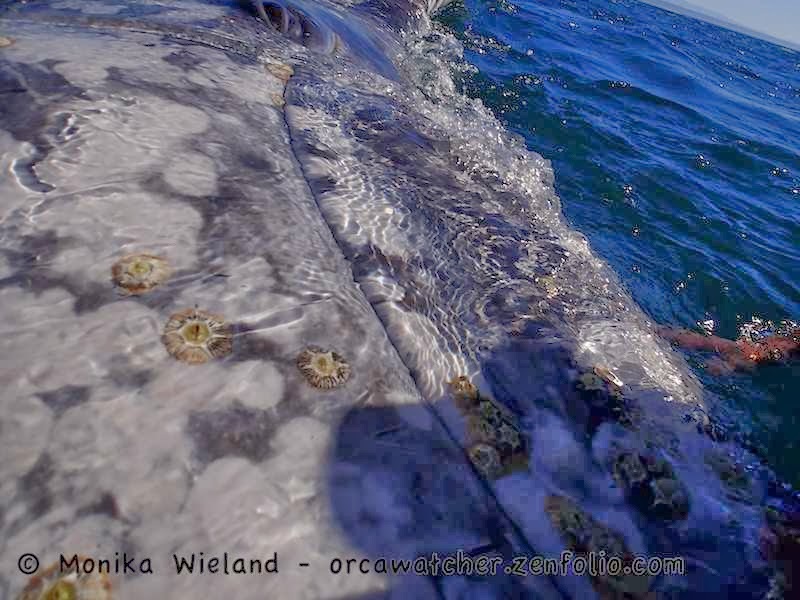 You don't choose the whale, the whale chooses you. 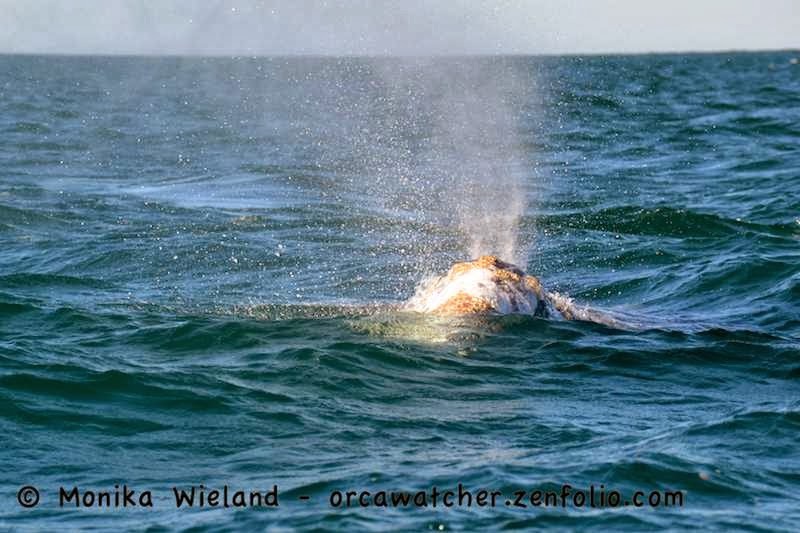 A nicknamed this whale White Head, and unlike any of the other whales we encountered, when he saw us, he made a beeline straight for us. I've touched a dolphin before, and it felt firm, like a wet rubber tire. 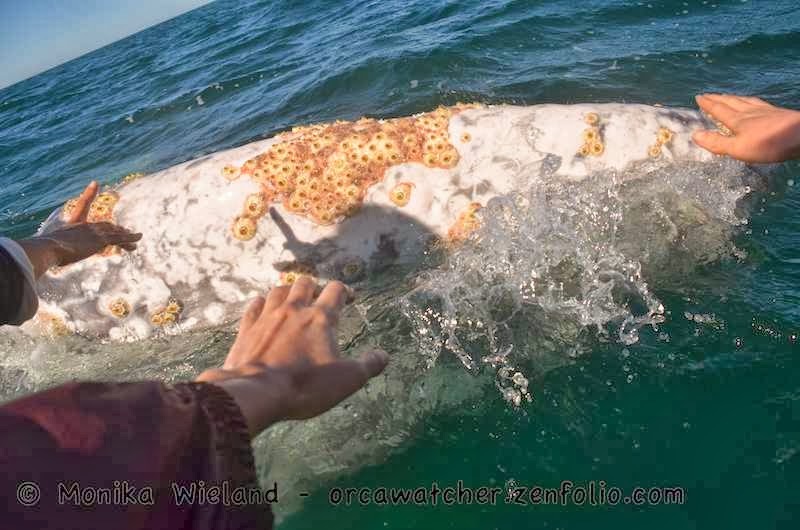 Gray whales were surprisingly squishy, like you could grab a handful of them. 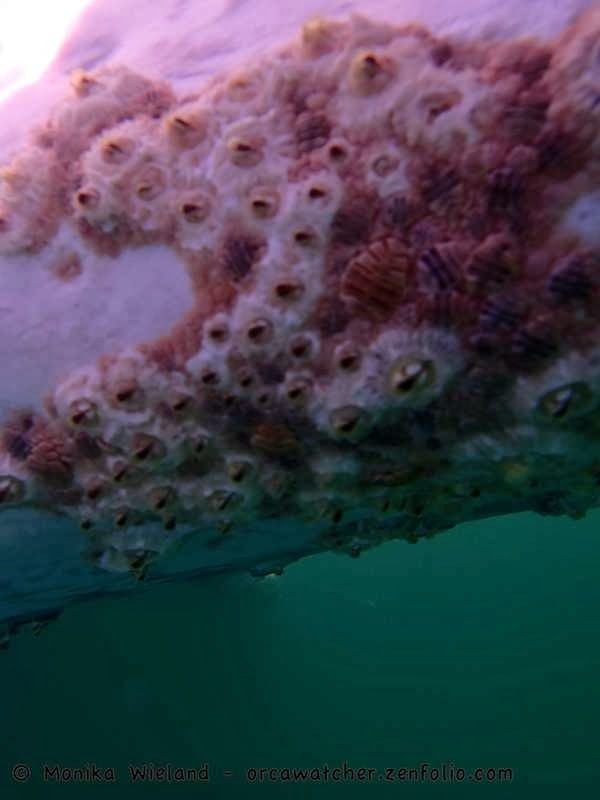 It's also amazing that something that comes out of the frigid ocean waters feels so warm. 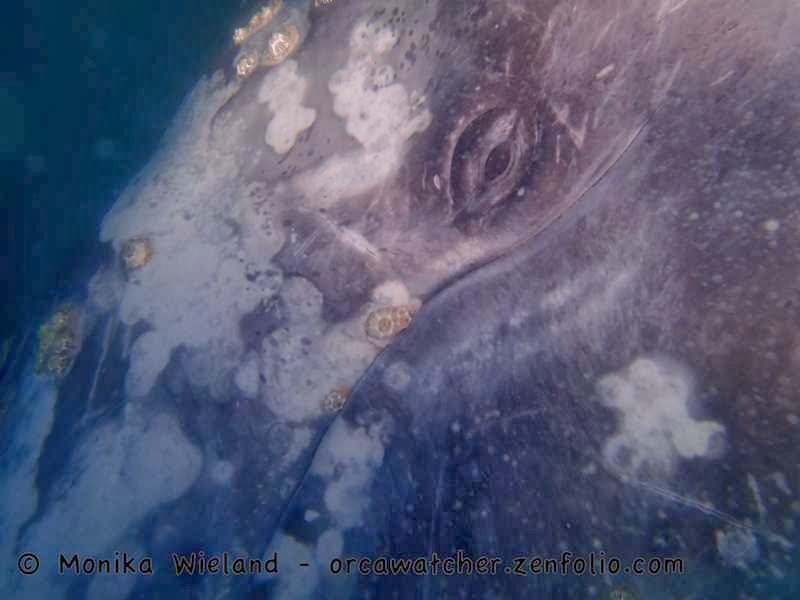 This time, the whale was definitely close enough for some underwater shots. I took about 200 of them, clicking away randomly, but the payoff was huge. 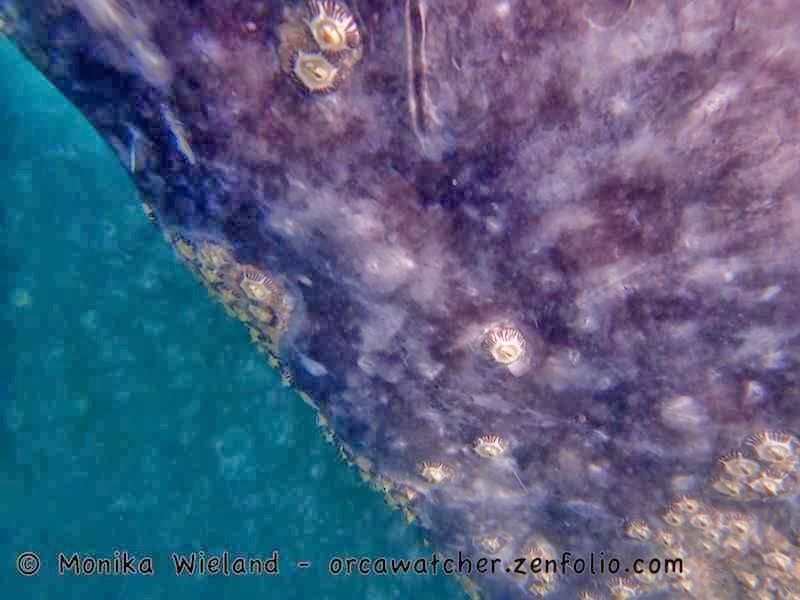 I got what I call my dream shot, an underwater view of a whale's eye. 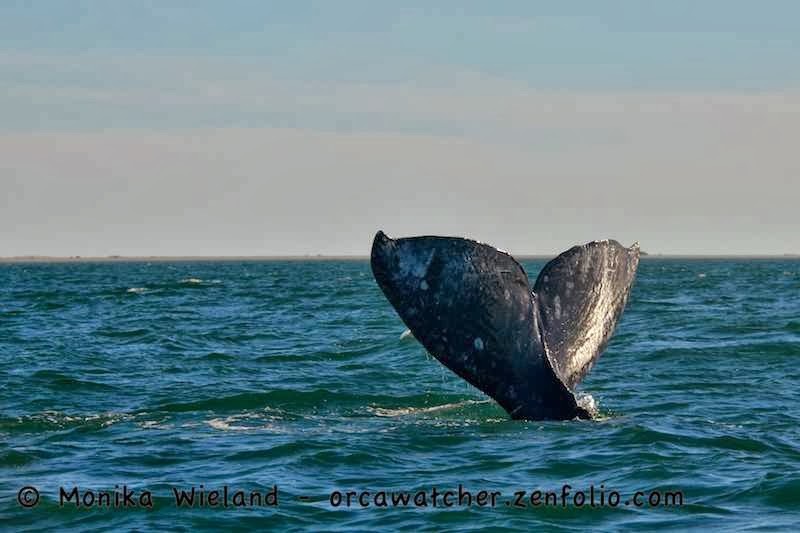 Probably my favorite whale picture from the trip. 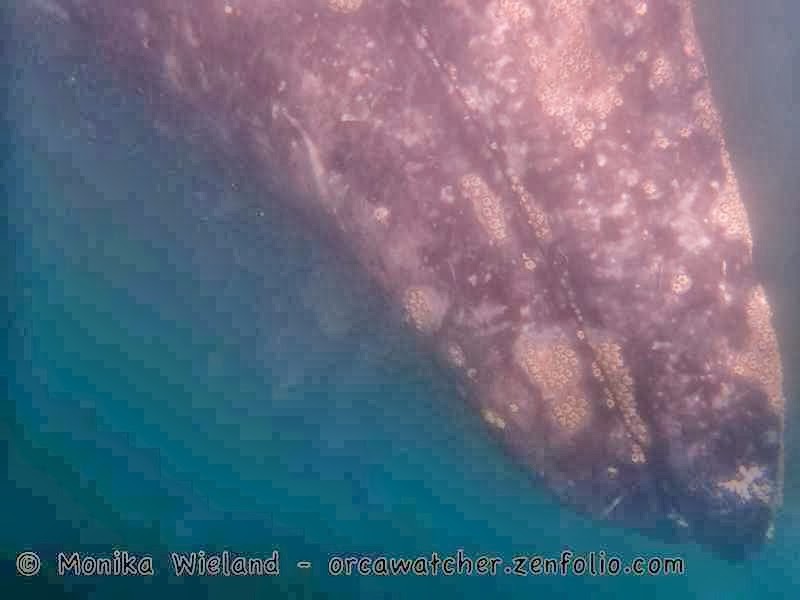 Here's a similar view when both whale and camera were above the surface. See the eye? 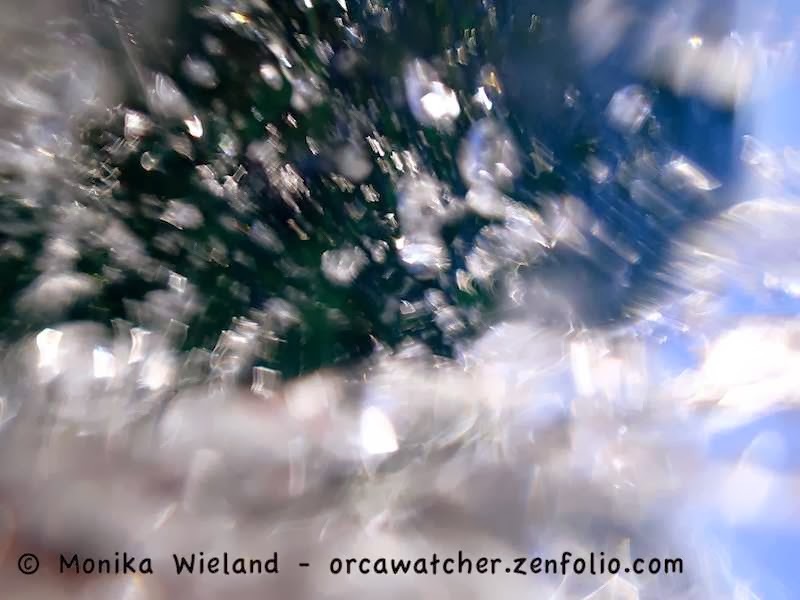 I really love the abstract nature of the following shot, where just a few inches of water is covering the whale's head. You can still see his eye here, but it's closed. White Head went back and forth between us and another boat a couple of times. Each time he left our boat, he did this backing-up head raise out of the water. I know it's anthropomorphizing, but it sure felt like it was his way of saying, "See ya later." White Head says "See ya!" When we and he went our separate ways, he breached three times! He sure seemed like a happy whale. It's this full-body shot that makes me think he's a juvenile - what do you think? 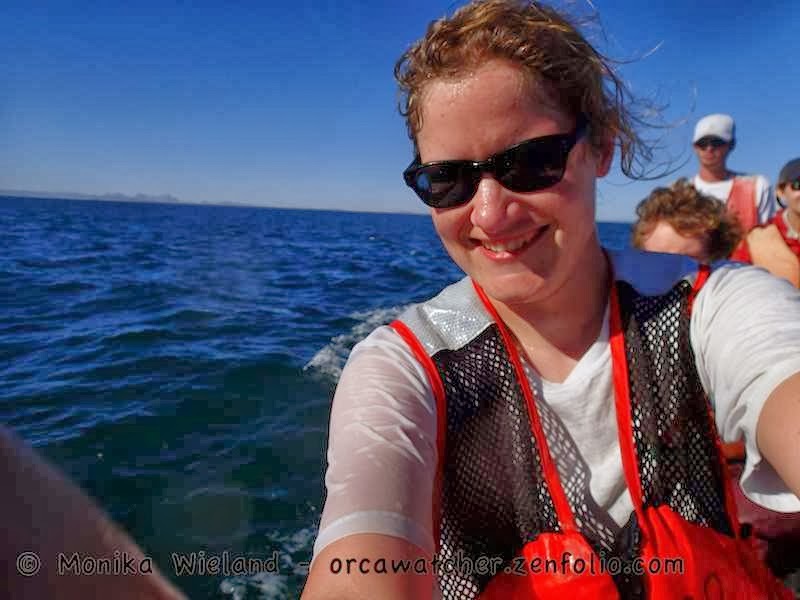 Then it was lunch, and back out on the water for our second whale watch of the day - what a life, right?! 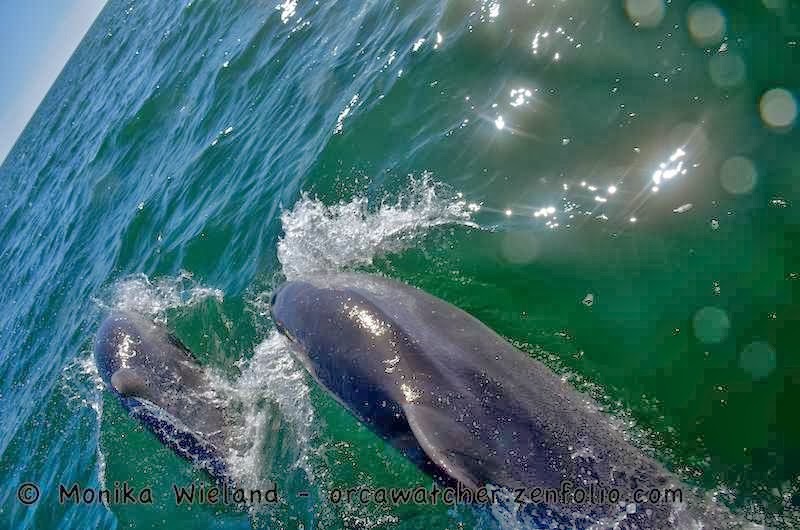 The highlight of this trip turned out to be some smaller cetaceans - a quartet of bow-riding bottlenose dolphins that stayed with us for a good ten minutes or so! Whales clearly dominated the day, but I did add least sandpiper (122) to my bird year list. Believe it or not, we weren't done yet. 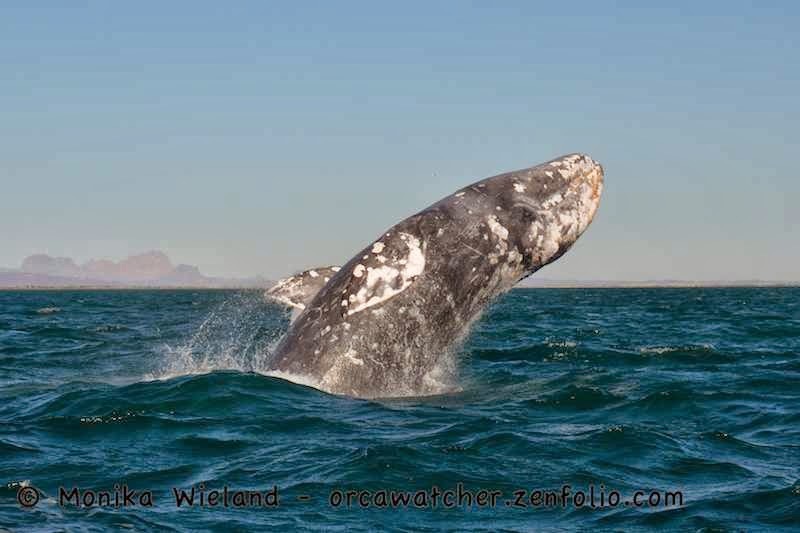 Still another full day of whale-watching, plus an amazing mangrove birding trip awaited us on day 3! 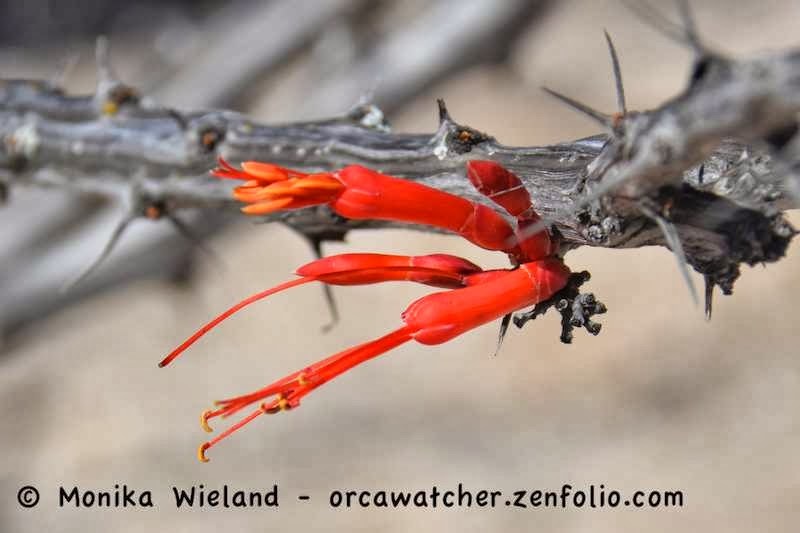 Super interesting blog once again with amazing photos. 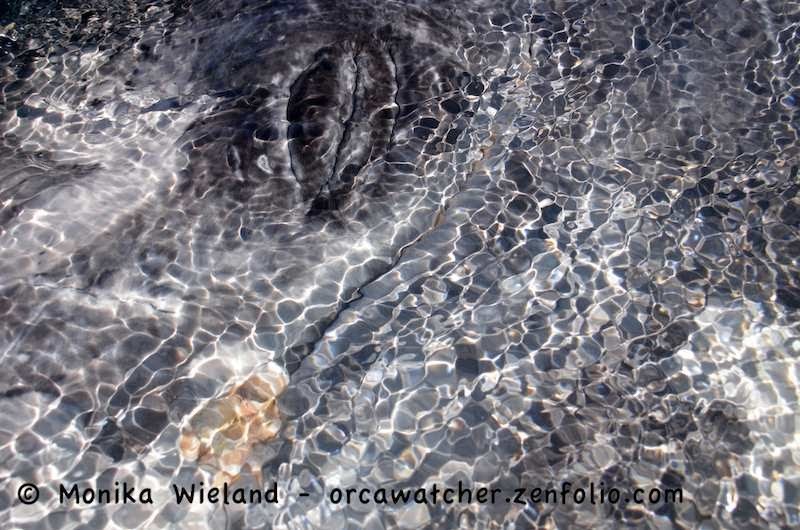 For some reason (I guess the artist in me), I LOVE the abstract water with the whale eye. I am anxiously anticipating the next chapter. Thanks for sharing your adventure. Great photos and writing. 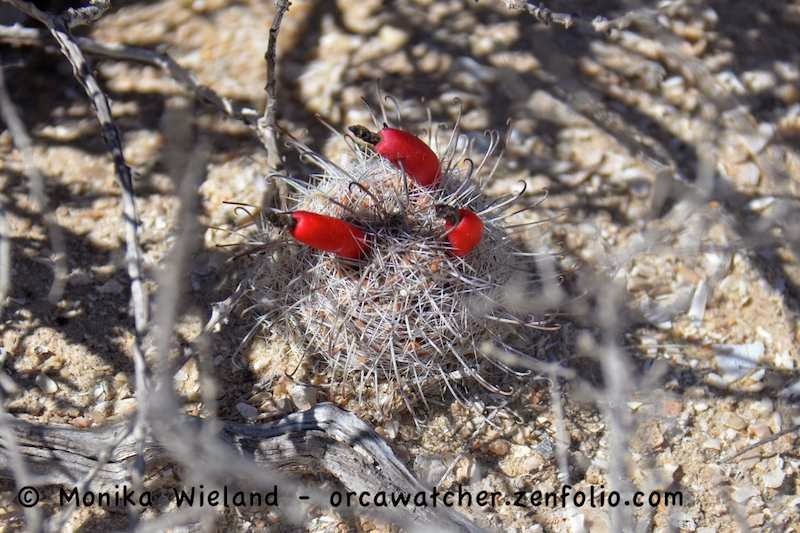 In Arizona we used to call those little cacti "fish hook" cactus.